Last night of the trip! Its hard to believe that 173 days ago I arrived in Dublin, Ireland with 6 months in Europe ahead of me. With only the first 5 nights booked and a return flight scheduled I worked my way through some great places and met a lot of great people. At times it felt like the trip would never end and at others it felt like the days were flying by. It'll take me a while to digest everything I've seen and done this trip once I get back but I'm really glad I took the chance to forget about "real life" for 6 months and simply experience new cultures, food, environments and people. After the stolen laptop ordeal yesterday, I couldn't get it out of my mind and mix in the emotions of the trip coming to an end I didn't sleep well at all last night. Today I came to the hotel near the airport and checked in and have been spending my last day in some much needed alone time. its also helping me look back on the trip. For dinner I went out and had one final doner kebap (which fortunately was absolutely delicious). I've grown fond of these extremely cheap and filling meals. the closest I've seen to them in the states are Greek gyros. I'm back at the hotel now and will try to head to bed early. I have a little wine to finish that I didn't drink last night due to the stress. Tomorrow morning I'll eat breakfast and head to the airport for my 10:35am flight! I'm writing this post from my phone because some time between 2:25pm and 6:15pm today my laptop was stolen from the locker in my hostel room. I noticed the door was a little weird today but didn't think anything of it. I spent the morning checking out free museums and got back to the hostel around 1 this afternoon. I was using my computer until I left just before 2:30 to check out the Reina Sofia and Prado museums, both of which were free this afternoon. I got back around 6:15 and went to get my computer from my locker. I thought maybe I was losing my mind and already took it out. I checked everywhere and found my bag of cables kicked under the bed. The laptop adapter was missing from it. I told the office and there wasn't really anything they could do. We know who it was but the person is long gone by now. I spent a while changing all my passwords so at least I should be safe that way. All my photos were backed up to Google, although not in full resolution. I really don't like this place but its too late to change plans tonight. I booked a hotel at the airport for tomorrow night. I already had a strong dislike for Madrid before this happened. This just put the icing on the cake for me. On the bright side, my passport wasn't taken and I had my camera and phone with me. I guess I'll be keeping an eye out for after Christmas laptop deals now. After breakfast I started the second walking route that's listed in one of the tourist guides I was given when I checked into the hostel. 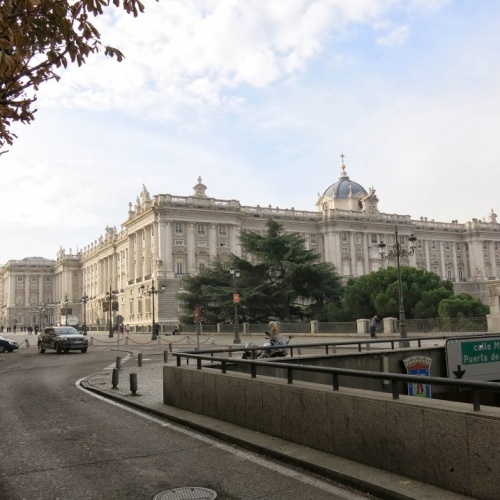 This route went over to Parque del Retiro via the Plaza de Cibeles, then down to the Reina Sofia Museum, up to the Neptune fountain and then through the Literary quarter before ending up back near the hostel. I started walking around 10:30 and already the streets were full of people. 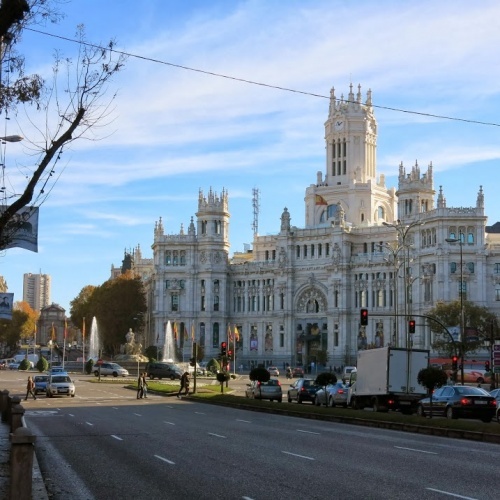 The Plaza de Cibeles was nice and then it lead to the Puerta de Alcala which was pretty cool to see. 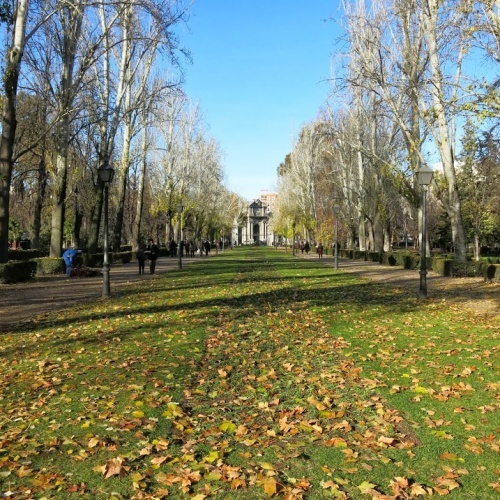 I ended up back at the Retiro park and fortunately today the weather was a lot nicer than yesterday. I spent some time there walking around before heading back to the Paseo del Prado (via some streetside bookstalls). Back at the Neptune fountain I doubled back into the Literary Quarter which is full of small streets lined with cafes, bookshops and restaurants. It ended up at the Spanish Theater before I cut back up to the Puerta del Sol. I bought a few things for lunch then came back to the hostel to eat. Since the hostel doesn't have an oven or a range I'm pretty limited in my cooking. I found some microwavable lasagna that didn't turn out too bad. 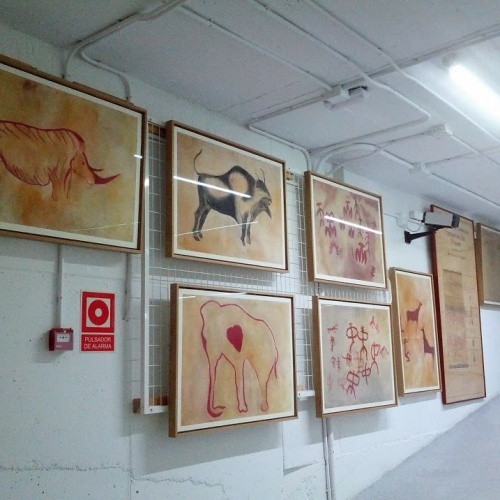 After lunch I decided to hit up a free museum and went down to the Museo de los Origines. 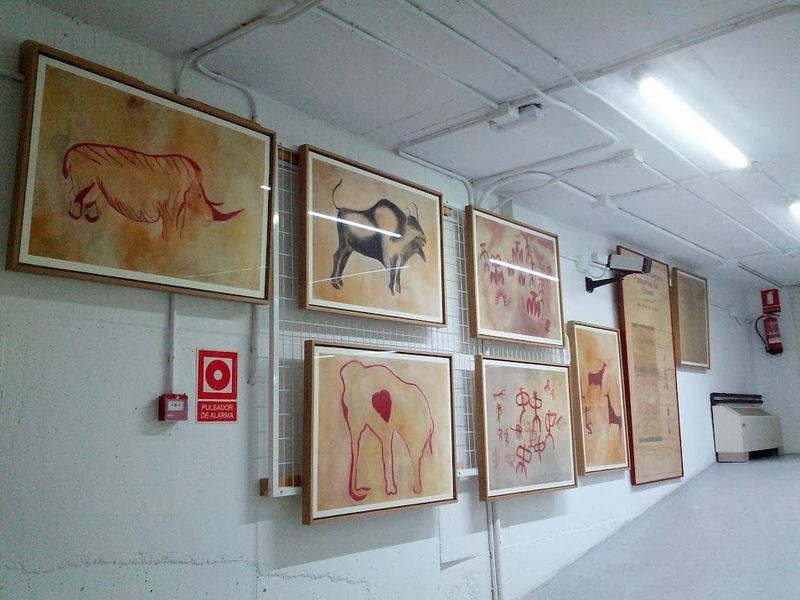 It was a big museum full of artifacts for the history of Madrid going all the way back to prehistoric times. It was nice being in the museum because it was completely empty. I went at the Spanish lunch time so everyone was out eating and drinking and I had the museum to myself. It was one of the few times today when I wouldn't be completely surrounded by people. After the museum I went down to the Puerta de Toledo (another big archway in the middle of a roundabout), but it wasn't nearly as impressive as the Puerta de Alacala. My plan was to walk all the way over to the Reina Sofia museum and try to hit it while it was free but I wrote down the wrong free times for Saturday. I ended up being a few hours early so I came back to the hostel. I'm planning on making tomorrow a "free museum" day so I'll aim to hit it then. I've got a full room at the hostel tonight which I wasn't really expecting. Before dinner the streets really started to fill up and I looked outside the little balcony out the hostel bedroom window and the streets were absolutely packed. I don't really like crowds and having this many people out on the streets was not something that looked like fun for me. I read for a while and then made dinner. After some wine I decided to heck with it, I'd head out and work my way through the crowds and aimlessly wander around. The streets were extremely packed and I ended up walking around several christmas markets and christmas light filled streets before coming back to the hostel just before 11pm. Like I said earlier, there are a bunch of museums that are free tomorrow so I'm planning on spending most of the day visiting them. Then on Monday I'm still planning on heading to Toledo to check out the old Spanish capital city and to get out of the madhouse that's Madrid for the day. I walked around quite a bit today exploring various parts of the city. I went over to the Royal Palace and up to Plaza Espana (which was actually filled with some kind of setup for Christmas). I walked to the San Miguel market and then back to the hostel. The San Miguel market is supposedly famous for all of its tapas. It seemed pretty touristy and everything was priced higher than it should have been. It was still nice to see and smell all the different tapas though. After lunch I wanted to check out the big indoor fruit, vegetable and meat market called Mercado de la Cebada. It was along the same lines as La Boqueria in Barcelona and Mercado Central in Valencia, except I feel like both of those were better. This one was two floors but most of the booth spaces were empty. I'm not sure if it's more populated on different days of the week but it didn't really have the same liveliness that the others did. On the way back I picked up a box of Turron (a type of candy that's really popular around here for the holidays). The box I got wasn't actually that good. If I can find some that tastes as good as the first one I had back in Cordoba I'm definitely bringing some back to the states. The stuff I bought was oily and didn't really have much flavor. 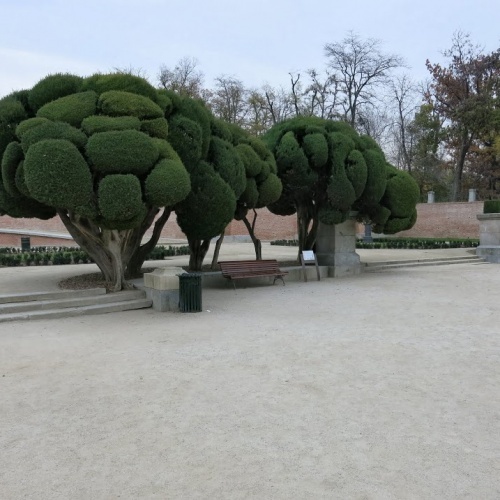 After that I walked over to Parque del Retiro, a gigantic park on the west side of the city. Unfortunately when I got there the weather was turning south and it was starting to sprinkle rain. The park would have been great to walk around in during some nice weather. I'll probably go back later in the week if the sun is out for a while. On the way back to the hostel the rain persisted and it's been raining the rest of the day. I've just been hanging out in the hostel for the last few hours and don't really have any desire to head out into the cold and get rained on tonight. Unfortunately this hostel doesn't have a lounge area to hang out in so I'm just chilling in my room. I'm a bit sad that I'm ending my journey here in Madrid. Every Spanish city I've been to so far has been awesome. Madrid is just a huge city filled with massive amounts of people, trash, beggars, prostitutes, and "cash for gold" people everywhere you turn. I really wish I would have spent more time down in southern Spain and then spent a night or two here before flying out. I feel like 5 nights here in Madrid is going to feel like a long time. I made it to my last stop of the trip, Madrid! The bus ride from Cordoba to Madrid was pretty uneventful. It took about 5 hours after some heavy traffic outside Madrid. I walked around a bit but it started to get dark so I bought some groceries and came back to the hostel. After I eat dinner I'll probably head out and do a little bit of exploring at night since it seems pretty lively with all the Christmas events and decorations everywhere. Tomorrow I'll hit a few of the main sights and I'm thinking maybe on Monday I'll head down to Toledo for the day, assuming it's not too much of a pain to get to/from.